I know, I know, I'm a bit behind. 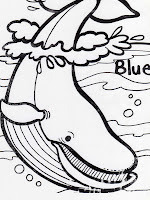 We are working on black this week and I haven't even posted our blue. 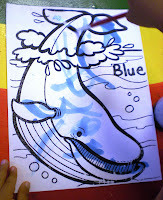 We went on a field trip to the pumpkin patch last we so our "blue" experience was a little short. Anyway, here is what we did. 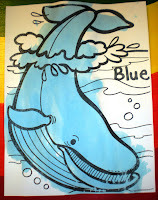 The first page of our book was a whale. 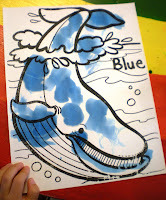 Since blue is associated with water alot, I decided we would water color our whale. 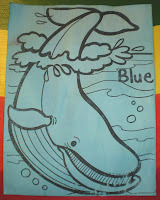 Some decided the whole paper had to be blue, some thought just the whale. They all did a great job. 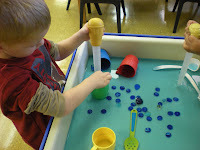 Continuing the water them, I had the water table filled with water. 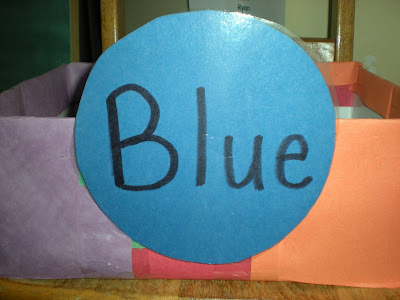 First I had put some blue items in the table. 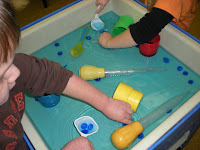 Then we went over to discuss how to make the water blue. The first response for both classes was to stir it. So we stirred and stirred, nothing happened. 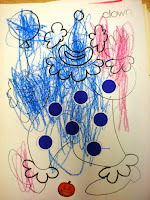 Then some of those "brighties" remembered adding food color to the yellow icing and they suggested that. Adding the food color was quite fun. We could have done this all day. The patterns each drop left in the water were beautiful. 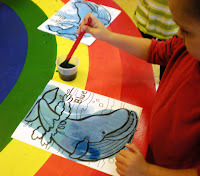 But, we added some color, mixed it up and off they went. I think out of all of them I only had 2 that were REALLY wet. They LOVED this though. 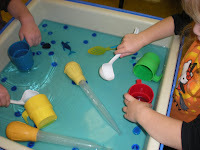 It's amazing how far basters can shoot water. 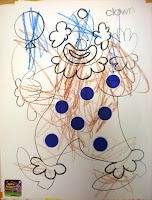 Then we real quickly did our second page which was to decorate the clowns outfit with the blue stickers and color him in. This week were into black. Also trying to do some Halloween activities. It's good black is a common Halloween color.